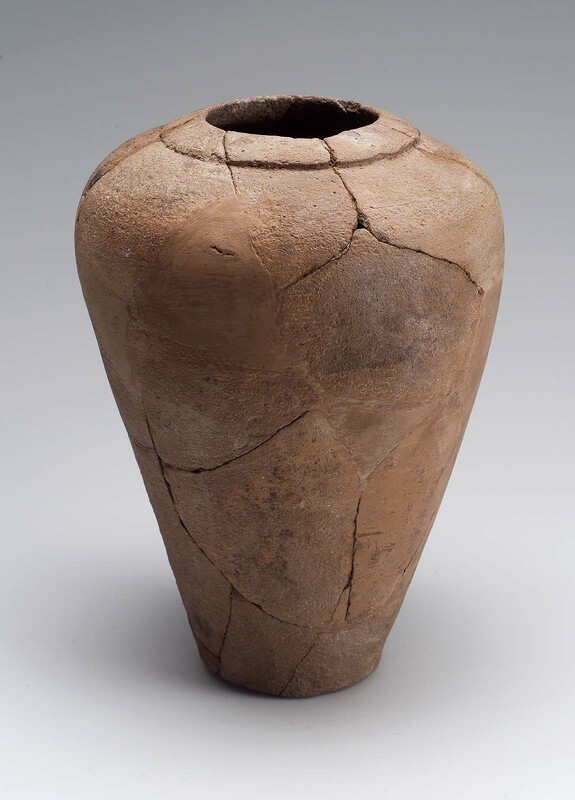 Globular neckless shouldered jar with collared rim and flat base: reassembled from sherds and heavily reconstructed. The entire vessel was manufactured using the wheel and the exterior unslipped. The flat base was finished on the wheel. The jar is unslipped and the surface is eroded. HH 1421/107 written in black ink on the bottom of the pot. Similar in form to the miniature versions, such as 13-12-22c.1. From Giza, G 7000 X / Exp.Ph. B 8524 (Bottom left) / BG. 452. 19? : excavated by the Harvard University-Museum of Fine Arts Expedition; assigned to the MFA in the division of finds by the government of Egypt.